Election organizers are ditching scantron systems and manual vote counting for live audience polling and mobile electronic voting. With robust e-voting software, audience response systems are making the elections process more efficient and convenient for organizers and voters. 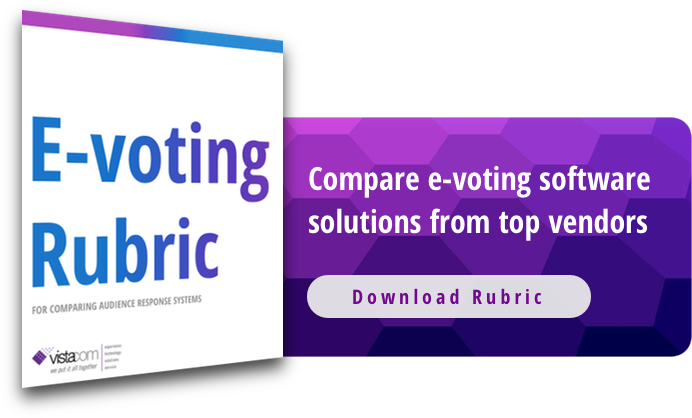 Automated vote tallying, reporting, voter registration and authentication come standard with most audience response systems’ electronic voting software. Which audience response keypad or mobile solution is best depends on the ballot complexity and security needs. Audience response systems used for live audience polling have networked registration systems that allow keypads to be assigned to individuals in various meeting rooms. Industry leading audience response systems also offer mobile solutions that enable remote participants to engage in live polls. Here’s the advice we give to poll organizers deciding between audience response keypads and mobile solutions. Audience response keypads are often the preferred choice of government agencies and other tightly-regulated bodies. Candidate elections and other ballots are protected from cybersecurity risk when deployed on audience response keypads exclusively. Audience response clicker devices have radio protocols and Wi-Fi avoidance features that prevent network interference from hackers. With mobile e-voting remote participants can join in polls and elections from any location, using their smartphone, tablet or computer. Without the need to purchase or hire hardware, mobile e-voting solutions are the most cost effective choice for decentralized voting. They are also the most user friendly option, as the need to become familiarized with a new device is eliminated. Very few mobile e-voting solutions are app-based. The majority rely on mobile-friendly web pages. Voting participants simply must use their web browser to engage in live ballots. Participants don’t have to search on any app stores or worry about their phone storage. The most advanced audience response systems have a flexible platform architecture that supports the synchronized use of audience response keypads and mobile devices. With these hybrid solutions, remote participants and in-person attendees can cast their vote with keypad clickers and mobile, tablet, or web devices. Though mobile audience polling is more affordable, audience response keypads are often the top choice for organizers of sensitive ballots. For these organizations, indestructible security comes at a premium. Thanks to the dynamic nature of audience response systems, organizers of less regulated voting events can deploy live audience polling with audience response keypads, mobile devices or both.